Laura felt a warmth inside her. It was very small, but it was strong. It was steady, like a tiny light in the dark, and it burned very low but no winds could make it flicker because it would not give up. February 7, 1867: Generations of suburban schoolchildren learned how to churn butter (at least in theory!) thanks to author and pioneer woman Laura Ingalls Wilder. She was born 146 years ago. Women who won't give up. There are some of those in our family. Generations of them in fact. Strong-willed, determined, but lovable and caring women. Women with integrity. Women with a desire to do good and make their surroundings happy and beautiful. Women who give more than what is expected to help someone or care for someone. I am blessed to have many great examples surrounding me. These women come in all shapes and sizes. Some are young, some older, some have walked this earth before I came here. Some are our grandchildren--or munchkins, as I call them. I learn from these women in our family. They teach me things. They probably don't even know. My mother was one who had great influence and brought happiness into my life. When Linnea was born my mother held her in her arms and said, "This one has a strong will." And she was right. I was always aware of that as she grew up and tried to channel her in good directions, as she had to believe she made all the decisions herself. Fortunately she made good choices and still does. Our three-year-old munchkin, Emma, looks like an angel and has the will of ten wild bulls. Her latest expression the other day when her grandfather and I were babysitting and tried to get her to go to bed was, "I will what I will". 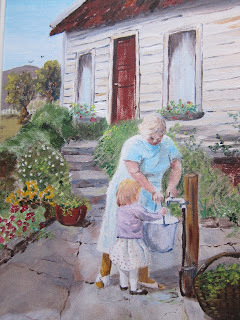 Today's art is an oil painting I did of my mother and Linnea many years ago.